Find the interval(s) where the following function is decreasing. Graph to double check your answer. To find when a function is decreasing, you must first take the derivative, then set it equal to 0, and then find between which zero values the function is negative. Now test values on all sides of these to find when the function is negative, and therefore decreasing. I will test the values of -6, 0, and 2. Now test values on all sides of these to find when the function is negative, and therefore decreasing. I will test the values of 0, 2, and 10. Is increasing or decreasing on the interval ? Decreasing, because the first derivative is positive on the interval . Decreasing, because the first derivative of is negative on the function . Increasing, because the first derivative is positive on the interval . Increasing because the second derivative is positive on the interval . The function is neither increasing nor decreasing on the interval . To find the an increasing or decreasing interval, we need to find out if the first derivative is positive or negative on the given interval. So, find by decreasing each exponent by one and multiplying by the original number. Next, we can find and and see if they are positive or negative. Both are negative, so the slope of the line tangent to is negative, so is decreasing. Is increasing or decreasing on the given interval? How do you know? There is not enough information to tell whether is increasing or decreasing on the interval . Decreasing, because is negative on the interval . Increasing, because is positive on the interval . Next, plug in each of our endpoints to see what the sign of f'(x) is. So f'(x) is positive on the given interval, so we know that f(x) is increasing on the given interval. Find the intervals where the following function is decreasing. The first step is to find the first derivative. Now we need to solve for when to get the critical points. Notice how factoring the 2 made the expression a little easier to simplify. The final step is to try points in all the regions to see which range gives a negative value for . If we plugin in a number from the first range into , i.e , we get a positive number. From the second range, , we get a negative number. From the third range, , we get a positive number. So the second range gives us values where the function is decreasing because is negative during that range, so is the answer. 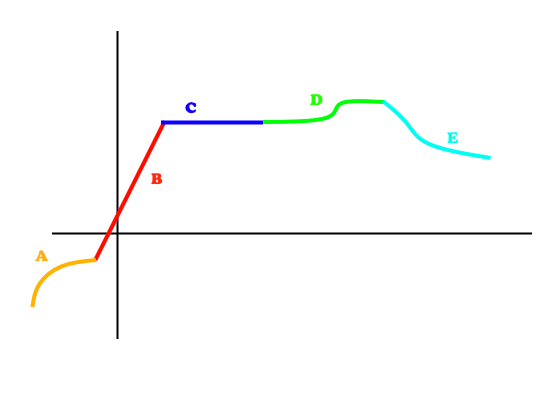 On which interval is the function shown in the above graph strictly decreasing? Interval E is the only interval on which the function shows this property. On which open interval(s) is decreasing? There are no open intervals on which the function is decreasing. is decreasing on intervals where . The function is increasing on this interval since the derivative is positive on this interval. The function is deecreasing on this interval since the derivative is negative on this interval. Thus, is the only interval on which the function is decreasing. On what interval(s) is the function decreasing? Therefore the derivative is zero at . To find when it is negative plug in test points on each of the three intervals created by these zeros. For which values of is the function decreasing? This function is never decreasing. This splits the graph into 4 regions, and we can test points in each to determine if is greater than or less than 0. If it is less than zero, the function is decreasing. The function is decreasing where . To determine where this is happening, differentiate the function and find where . This will split the function into intervals where it is either increasing or decreasing. this has solutions for .